This week's Free GM Resource might not be everybody's cup of tea (kind of a pun), but it really appeals to my inner map geek. The Map of Early Modern London is a bit of a work in progress, but it has improved much since I first became aware of it. Basically this is an online copy of the Civitas Londinum, AKA The Agas Map, a woodcut map of London made in 1561. The really cool thing about this historical map is that because it is a digital map, the folks behind this project are able to overlay a bunch of cool information onto the map. You can choose to highlight specific neighborhoods or all the guildhalls. Want to look up all the known taverns? Just a few clicks and you are there. You can kind of look at things in reverse as well. Click on a spot on the map and you'll be told what is there and be given a list of historical references for that location. 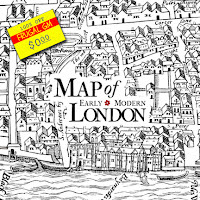 I think the Map of Early London can be a valuable resource and even if it isn't, for you, it could be a fun historical diversion.